Life had not gone according to plan for Sheridan Voysey and his wife, Merryn. When infertility ended their dream of becoming parents, they uprooted their lives and relocated from Australia to Oxford, England, so Merryn could pursue her professional goals. But the move meant Sheridan had to give up his well-established career in Christian radio, and though he was experiencing some success as a writer, he couldn’t reconcile his expectations for his life with the reality he was living. Lost and directionless, he came to a sobering realization: I don’t know who I am. Following the example of many a seeker, Sheridan decided to pair his spiritual journey with a literal one: a 100-mile pilgrimage along the northeast coast of England. Inspired by the life and influence of the monk Cuthbert, who was among the first to evangelize northern England in the 600s, Voysey and his friend DJ traveled on foot from the Holy Island of Lindisfarne to Durham, where the famed Lindisfarne Gospels were on display. What makes us who we are? What shapes our hopes and dreams, and how do we adjust when things don’t go as we hoped? Can we recover if we make a choice that’s less than perfect? Voysey tackles these questions and others as he deftly weaves together Cuthbert’s story, the history of early Christianity in England, and his own struggle to find his identity and purpose. His introspective writing leads listeners to consider their own stories and reflect on how God calls each of us to an identity bigger than any earthly role or career. Part travel memoir, part pilgrim’s journal, The Making of Us is a quiet story of trust in God’s leading for our lives, no matter where our paths take us. Follow along on Sheridan’s journey with photos available in the audiobook companion PDF download. Sheridan's latest book is about a journey – a pilgrimage he shared with an old friend. 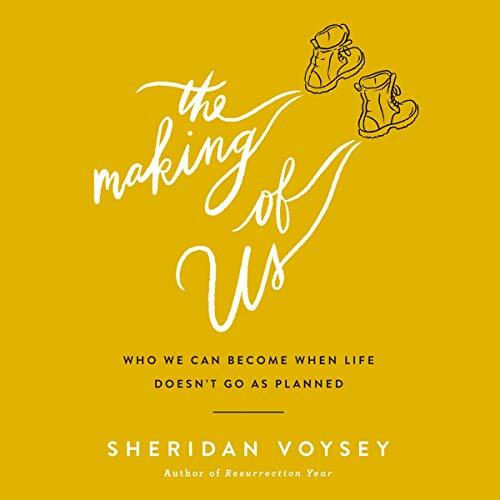 By listening to The Making of Us, which is read by Sheridan himself, you are invited to step out on that pilgrimage; to listen in to deep conversations where reflections are gathered and truths are shared. In turn, you will consider the journey of your life to date, and reflect on where that journey has not gone as you planned. Sheridan has walked the path of brokenness and there is nothing trite about this book, but it does contain the freeing truth that our God is receptive: so much so that sometimes the pain we encounter can be part of the making of us. I highly recommend you listen to this book: it is full of hope and life!